Did you guess? 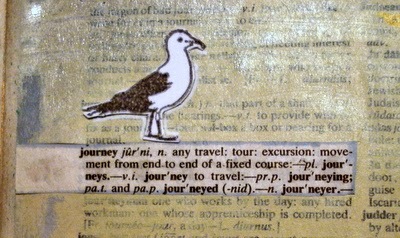 I love the seaside and decided to depict a journey to the coast. I used stamps that were from a magazine freebie set and the bathing belle is an Acid Drops and Whatnots stamp. Great choice for that letter - definitely not seaside weather today in these parts - torrential rain for most of the day. This is wonderful - such great colours. A nice word choice. I like the way the bather's outfit and the lighthouse match. Fantastic page, love the bathing belle. I think she would be a bit cold today. Really like your images and you've created a great fun journey's end!! I always love looking at your pages, val... the detailing is always second to none and this one is no exception... outstanding! Great page Val - love the Whatnots stamp.......they are great. Delightful - well done!! I cannot get the hang of rubber stamping in my dictionary. It just does not want to come out properly. I love your page - wonderful journey! 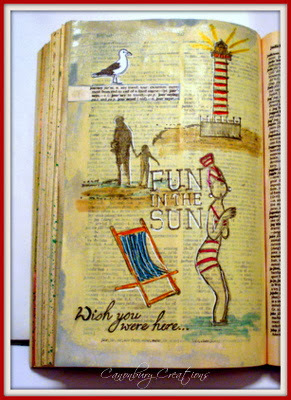 Love your journey to the seaside page. It makes me smile and think of fun summer days.